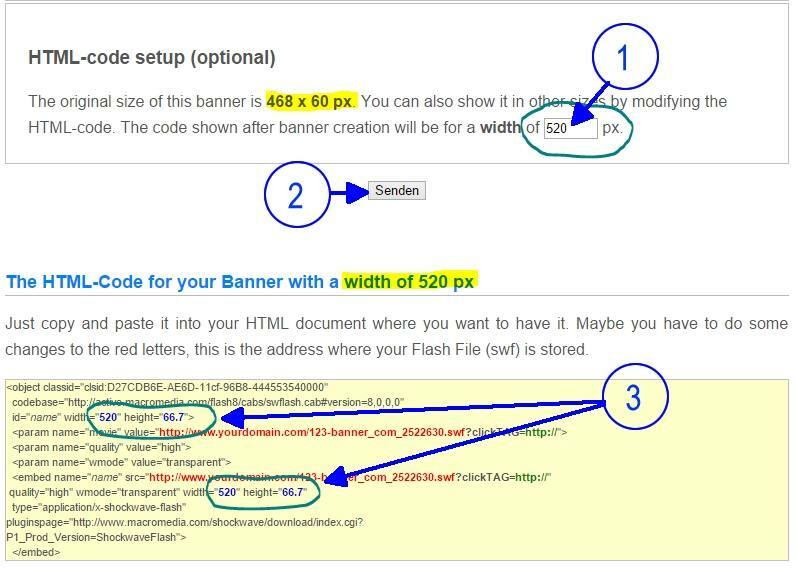 If you want to show a banner or a slide show in another size than the original one on your website, you can do this by modifying the HTML-code. Since the values for width and height are included in it. Setting up the HTML code by entering the required width before creation process. Banners without images can be scaled endless. Also those with pictures can be scaled up to a certain value, but you will have to accept losings in quality since the pictures aren't vector based. When scaling, it's very important to keep the width to height ratio! This means when increasing the width about 10%, you have to increase the height about 10% as well. To make this calculation easier for unskilled users, you are able to enter the width you need directly before banner creation. If you do so, the corresponding width will be calculated and be contained in the HTML-code shown after creation process (at the bottom of the final page). 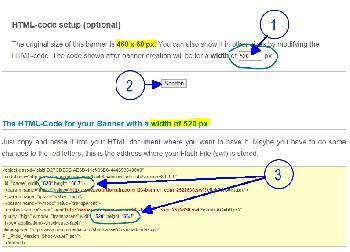 → If you change the value at circle 1, the values in the html-code after banner creation will be calculated accordingly. Thus you have to replace this HTML-code on your website, or at least the values at circle 3. Circle 1 has only effect to the HTML-code, not to the way the banner is displaied on this site.With other words, you will see the result only on your own website.